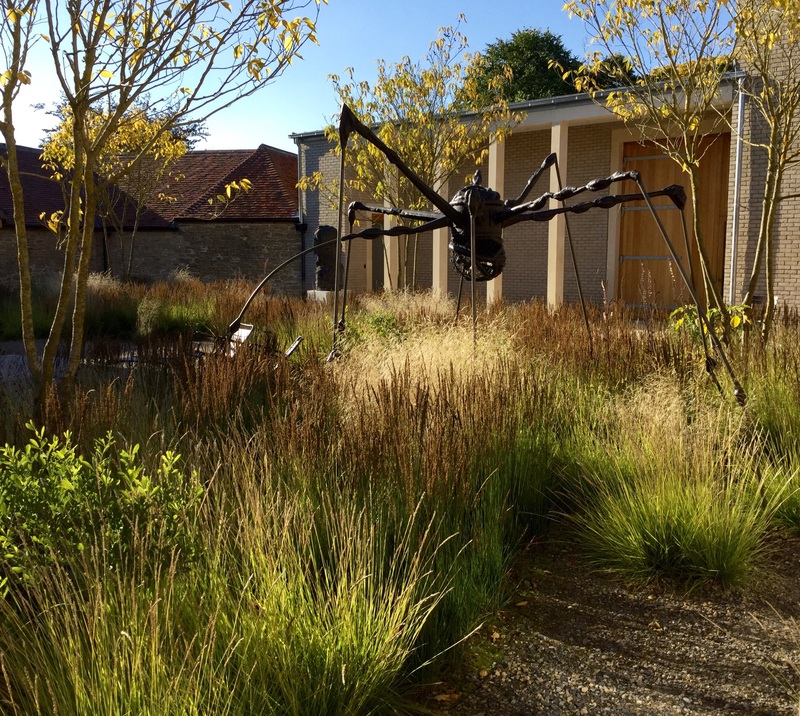 An excursion to the Hauser and Wirth art gallery in Bruton, Somerset with gardens designed by Piet Oudolf has long been top of my wish list. Based on a flurry of recent visits, these are my impressions of Oudolf Field and the Cloister Garden in early autumn. 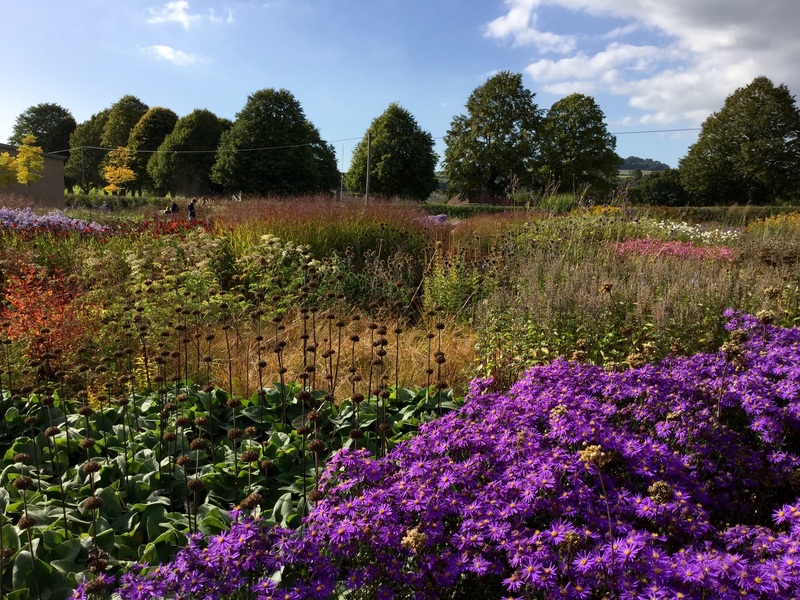 It was a perfect time to go, the planting seemed poised in time midway between late season colour and sumptuous seedheads. 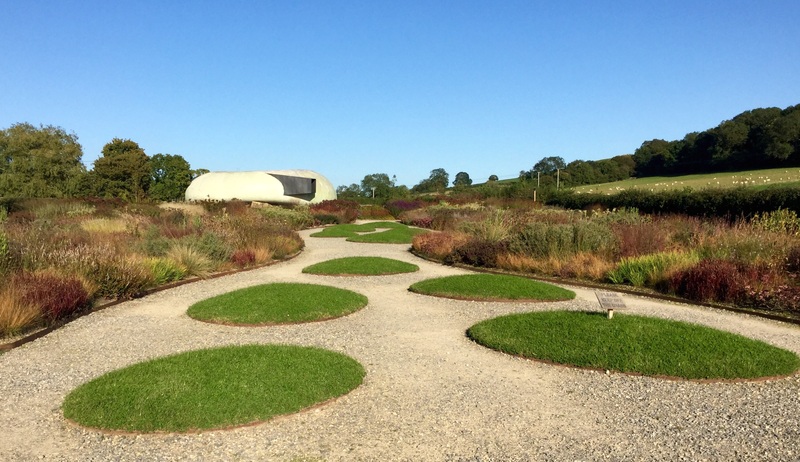 The initial view of Oudolf Field greets visitors while crossing a cool stretch of formal lawn that acts as a relaxation area and transitional zone between the gallery proper and the naturalistic planting. 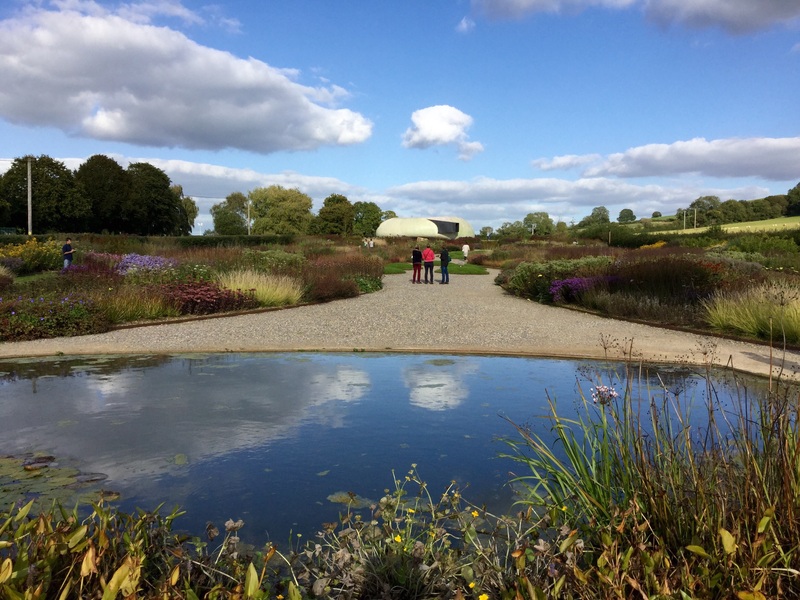 A further delineation of space is marked by a rimless reflective pond, on the gallery side is a zone of wet meadowland and marginal planting. At the far end of the garden a shell like structure hovers above the garden. To one side of the pond sat Anri Sala’s surreal working timepiece ‘Clocked Perspective’ with its oblique face, I say “sat” as within days said clock was en route to tick noisily in Mexico. It was worth pausing at this end of the garden before emersing ourselves in the planting. 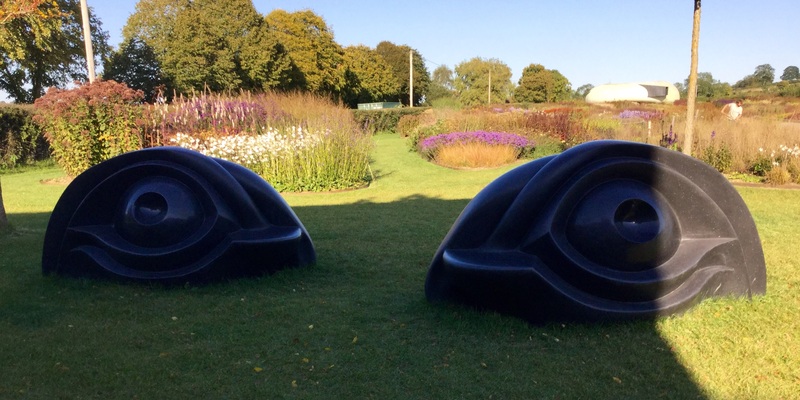 I like Louise Bourgeois’ all-seeing pair of black granite ‘Eye Benches’. 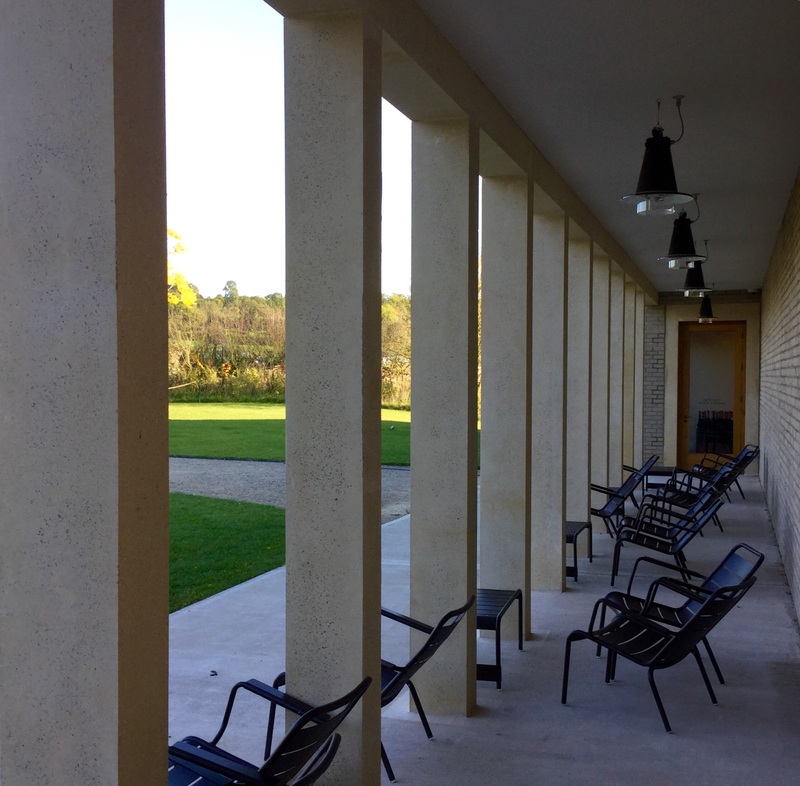 Architect Luis Laplace’s cool limestone colonnade is a good place to reflect on the design of the garden. This, the most beautiful garden guide I’ve ever seen, is based on Oudolf’s original design and has a complete colour coded key to 115 genera used in the planting. 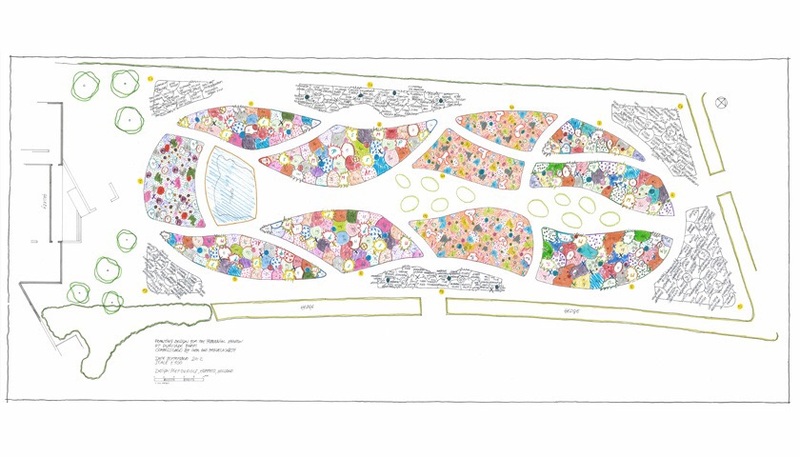 Containing 26 000 plants it is a complex, seasonally layered scheme. The subtly mirrored, asymmetrical borders contain blocks of plants either side of the sweeping gravel path. To one side of the mid point are three looser plantings, the Sporobolous Meadows. Here the Dutch designer’s hallmark plants mingle in his characteristically painterly style. Side borders (in grey) are adjuncts to the main beds, this is where taller plants are found. 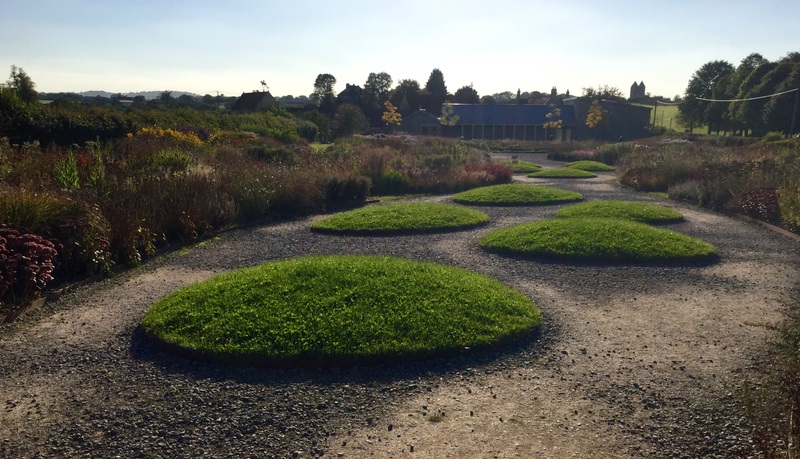 The layout of paths encourages a meandering exploration of the space, the planting has a leisurely rhythm and, for me, the kaleidoscopic changes of perspectives were the greatest surprise. The 1.5 acre site is rectangular, flat and bordered on two sides by rolling countryside complete with grazing sheep. Hawthorn hedges, dating back to its days as a field-proper, enclose the space, behind which on the third side a line of trees that screen the sports field next door. From here with the slight rise of the land, it’s possible to imagine what the once-pasture looked like before gallery owners Iwan and Manuela Wirth embarked on their ambitious project to reinvent the Grade II listed Durslade Farm. Although I have been following news about the garden since it opened last September, I’d missed the arrival of the gallery’s largest single exhibit the Chilean architect Smiljon Radic’s Pavillion installed in March. I’m glad I did, I think I’d already come with excess baggage aplenty. Until this spring the expanse of rough grass at the far end of the garden remained notably vacant. In retrospect, I wondered if the area was conceived as a plinthe with precisely this sort of folly in mind, even the rough hewn quarry stones looked at home. Without the help of the exhibit’s booklet, I’d never have guessed Radic’s inspiration was Oscar Wilde’s parable The Selfish Giant, making this his interpretation of the giant’s castle. Maybe the Swiss art dealers represent the big-hearted giant? The gardens and galleries are open Tuesday – Saturday, 10 am -5 pm. Admission is free. Swathes of flowering Panicum virgatum ‘Shenandoah’ shimmer and shimmy, used in a mass their dynamic nature is almost hypnotic. The hues of the panicum blend harmoniously with the planting, especially with the last show of colour from orange Helenium ‘Moorheim Beauty’. 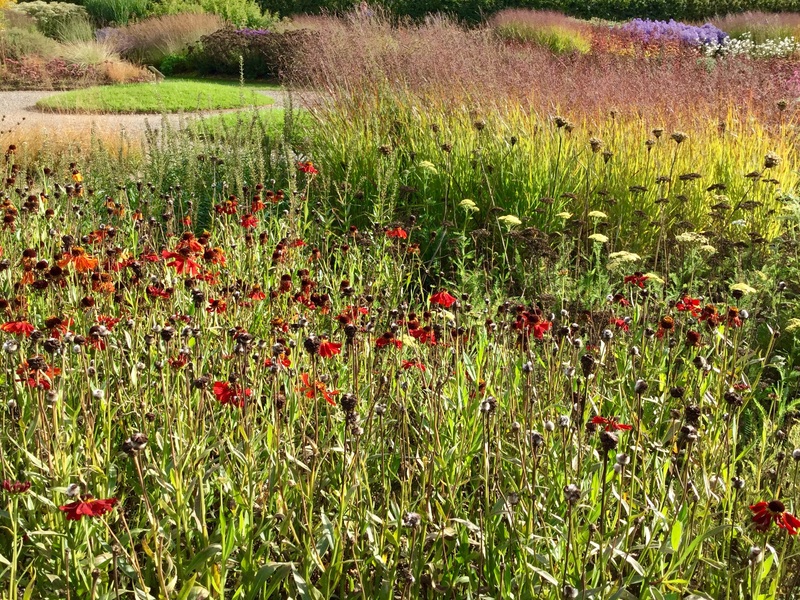 In general the planting is kept low, the result is an undulating quilt of meadowlike vistas. 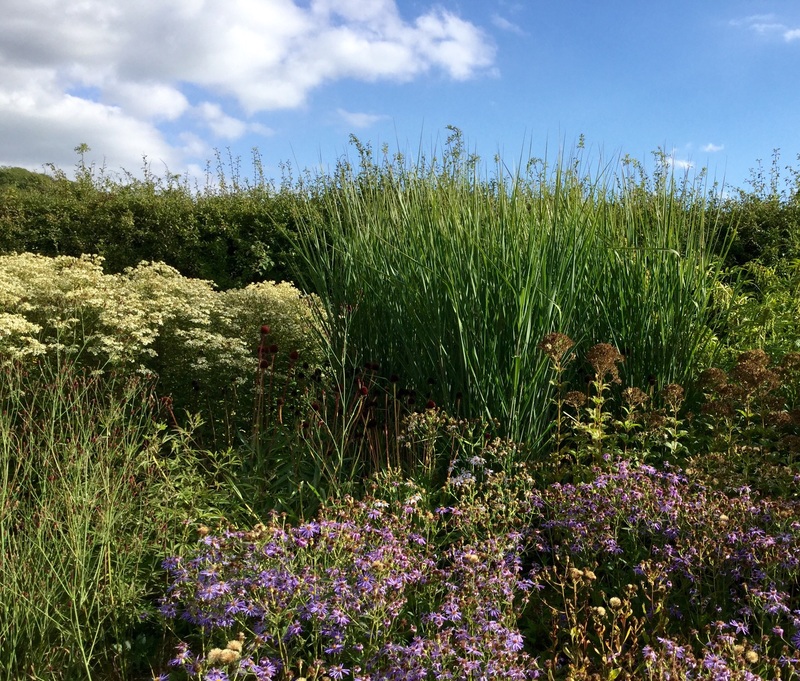 A second equally upright but much taller Switch Grass, Panicum virgatum ‘Cloud Nine’, not yet in flower, creates blue tinted accents towards the back of the beds along with other statuesque perennials. 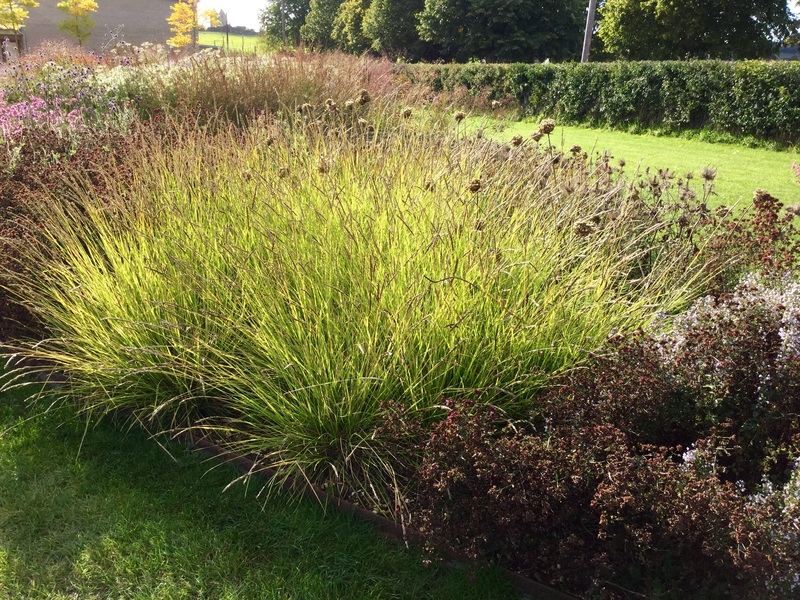 North American prairie grasses tend to be late flowering, making them useful for autumn interest. 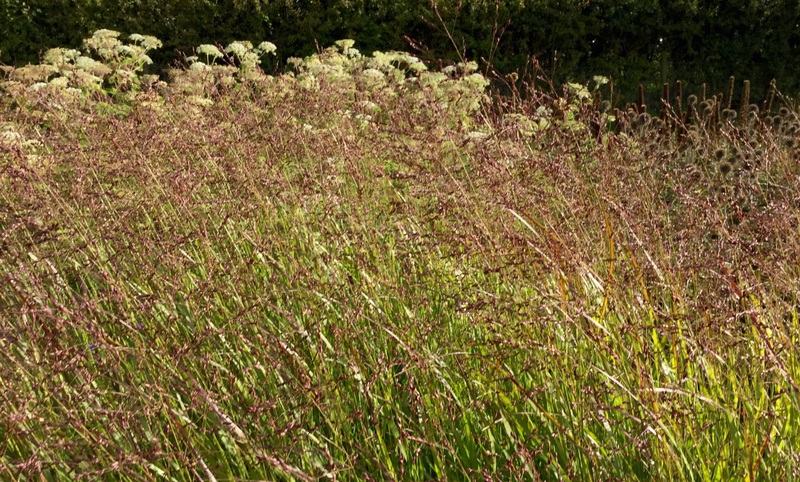 Other than Molinia ‘Transparent’, this is the only other tall grass used in the garden. In flower tall panicums make a dramatic statement reaching 2 metres or more. Lower growing Sesleria autumnalis, a European native, carries equal weight in the planting, providing stunning contrasts in the autumnal borders. As a near evergreen cool season grass it puts on a terrific year-round performance with a second burst in the autumn when it turns into chartreuse mounds. 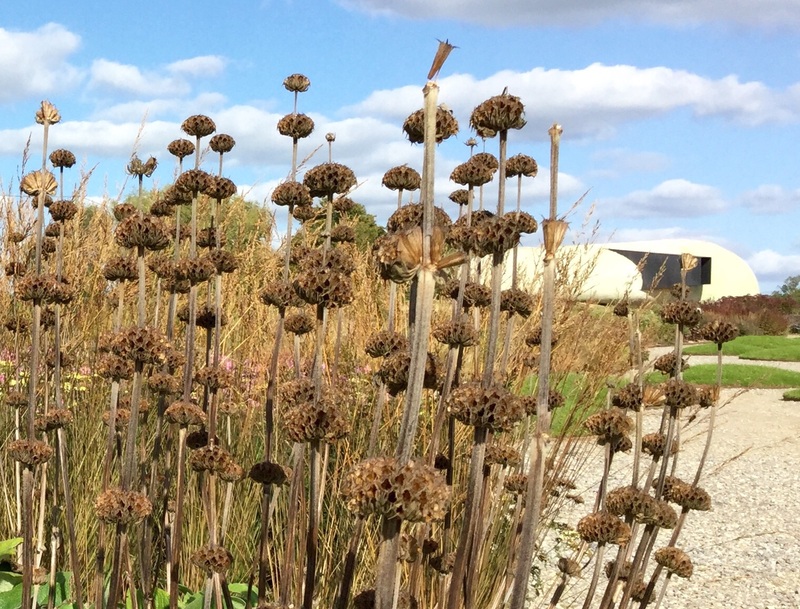 I love the way the ripening seed heads stand out like dark rockets against the luminous foliage. In just one year sesleria has filled corners like this, whereas it will take a while longer for others like the charmingly airy but slow growing Sporobolous heterolepsis to stand out. Next year there just might be a hint of popcorn or coriander in the air, thanks to the maturing prairie dropseed. The Cloister Garden is where architecture of old meets new. This is a bold and dramatic space, overhung by more than shadows from the elevations of the buildings. 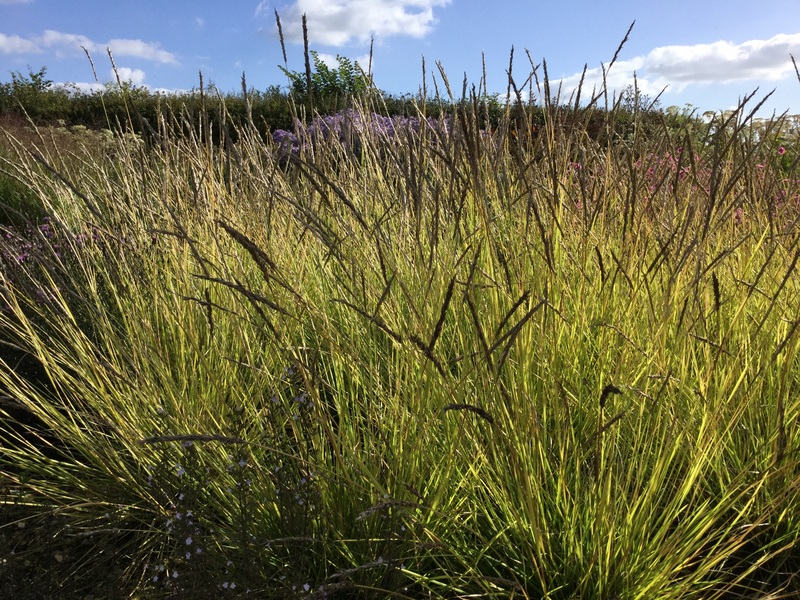 Oudolf’s planting is superbly refined hinging as it does on the use of just three grasses : Sesleria autumnalis, dwarf Molinia ‘Moorhexe’ and Deschampsia ‘Goldtau’, all of which appear in the larger meadow planting, here they create a different effect and mood. It’s hard to imagine any other plants that would work as well to complement the disparate colours and textures of the natural and manmade building materials : straw blond deschampsia and limestone; ripening dark seed heads of the molinia and wood/stone/tiles; and the space made airy by glowing autumn moor grass. I bet it looks stunning at night …. On close inspection of both the plan and the gravel drifts, the seasonal planting is much more sophisticated than first meets the eye, there are seasonal treasures – in late September ethereal whisps of actaea plus fresh bursts of colchicum stud the mix. The dynamic spider was also created by Louise Bourgeois. I hope it stays. I wished I could stay too, however, tea in the courtyard beckoned before the journey home. 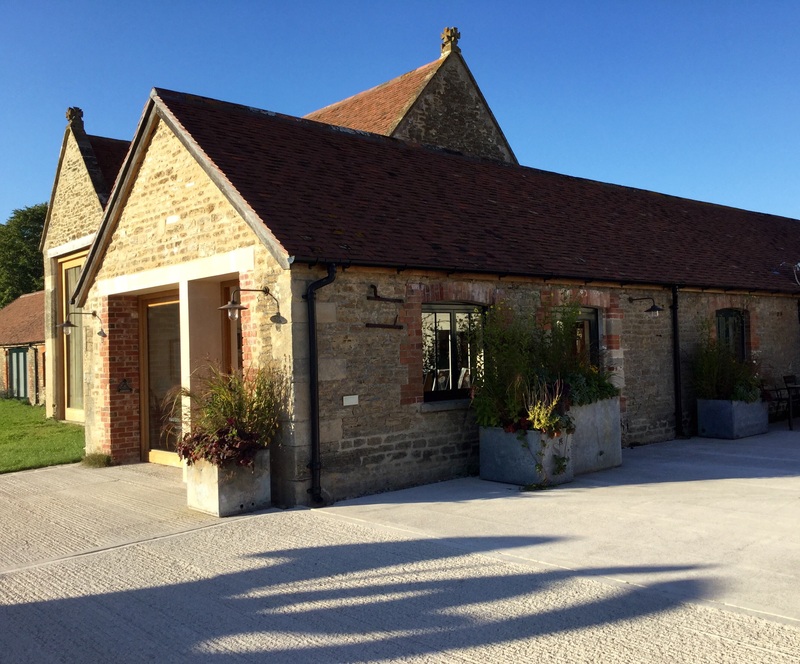 For those with the good fortune to live further afield than I, it might be an excuse to stay in At The Chapel, a trendy restaurant and boutique hotel close by. Incidentally, they manage some of the on-site catering for the fabulously funky Roth Bar and Grill. Bruton itself is worth exploring, the low-down was given in an article in The Telegraph earlier this year. 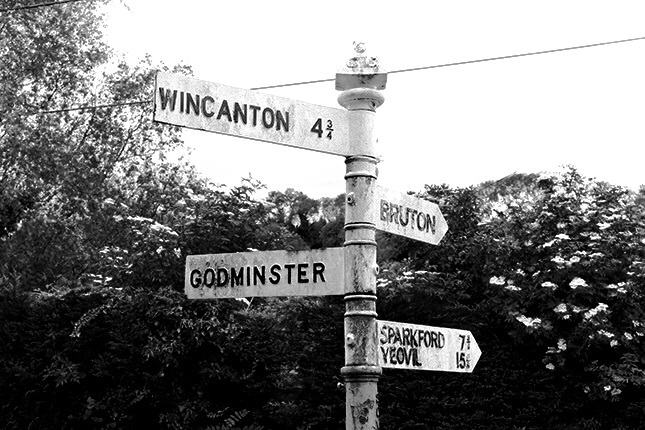 On his deathbed, John Steinbeck fondly recalled the picturesque village of Bruton as a place where “Time looses all meaning. All the peace I dreamed about is here.” He was reflecting on his extended retreat at Discove Cottage where he worked on a first draft of the posthumously published The Acts of King Arthur and His Noble Knights. Even after only a handful of hours, I felt the same way about this artful garden. 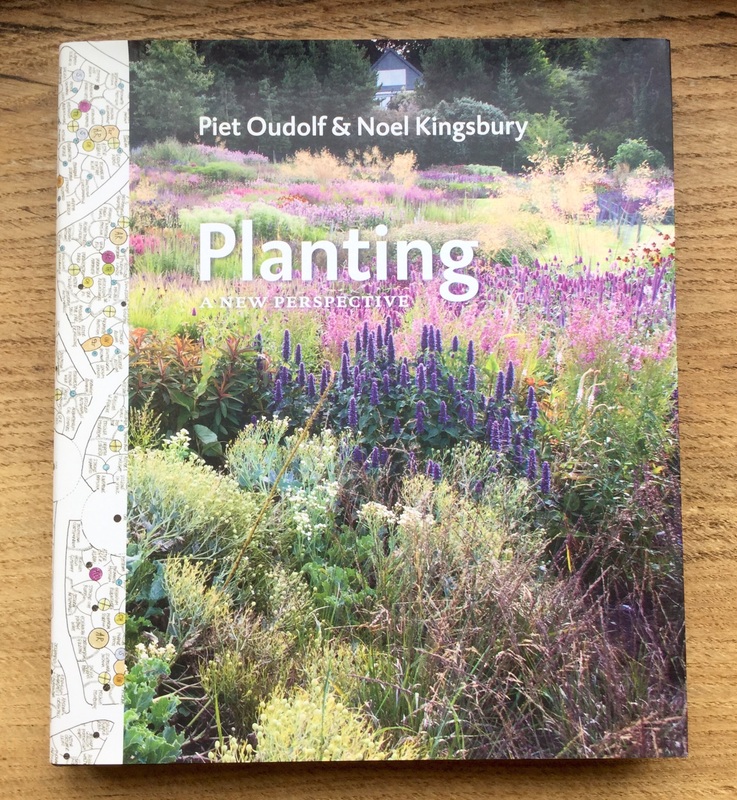 It really was like falling down the proverbial rabbit hole to emerge among the pages of one of my favourite reference books, Planting : A New Perspective (Timber, 2013) by Piet Ouldolf and Noel Kingsbury. 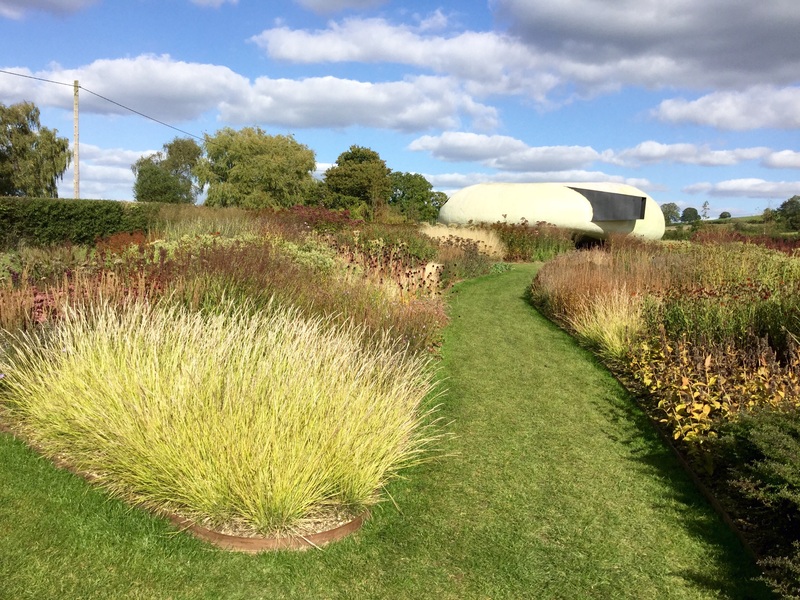 Note : There’s a great series on YouTube of gallery events last autumn/winter, Piet Oudolf in conversation with Tania Compton begins with a 20 minute discussion of the garden’s concept and design. Brilliant post. Thank you for such a detailed review and the reminder that the garden looks so good at this time of year. 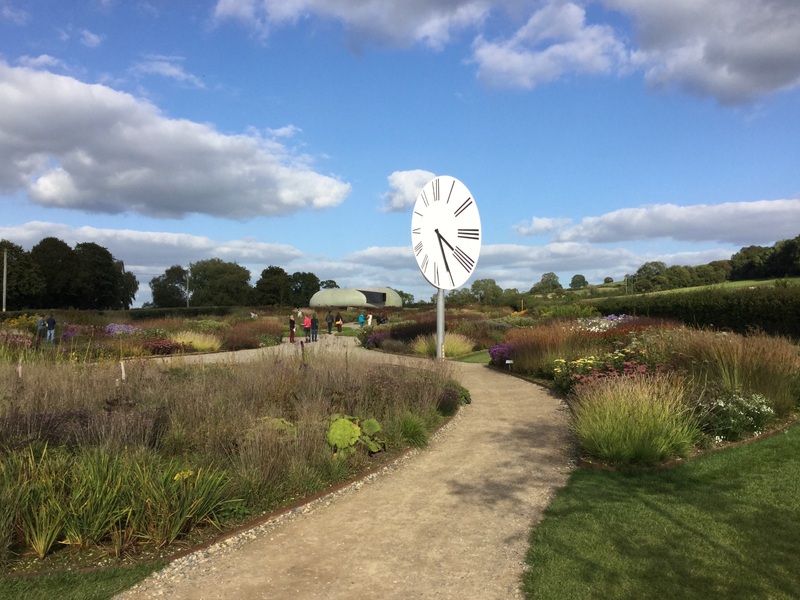 I’m glad the clock is going-it seemed out of place and I love those clover rounds which were just being planted when I was there in summer. Yes, I must get to see it next summer … this winter, … and next spring! Will you visit this autumn? It would be interesting to see how you think the planting compares with summer. I’m glad I’m not the only one who wasn’t sure about the ticking clock, I thought it looked better when viewed with planting in front of it. Maybe it was the industrial looking pole? Oooh.. I’ve been meaning to go all summer and still not got round to it. Not so far for me either. I’m on the lookout for Sesleria autumnalis now too. The more I look at prairie style planting the more I’m convinced it’s the way to go for my steep slope. It’s getting the relative heights right that will be the extra challenge. I’d recommend a visit in autumn, especially with seslaria on your wish list. I’ve just planted out a batch, such easy going plants and great ground coverers for difficult to access spots. Knoll Gardens had the best size per price when I costed them earlier in the summer, think Crocus have recently reduced their prices too. Oh WOW – On my must do list ‘if I win Lotto’ and can travel around the world to see it!! Always hope. ‘If I win Lotto’ I’ll be after one of those benches! Wouldn’t it be wonderful to be able to travel the world and visit all its great gardens? Meanwhile, I’m happy to make do with books, blog posts etc and imagination. It’s wonderful there’s so much info available these days. Gosh, it looks amazing. I love your photos. Sounds like I need to get to Bruton, too! I’m completely with you on the plants you singled out; it seems we have very similar taste. Will add this garden to my long list. A box of tissues may be required, it’s that beautiful 😉 Always nice to be in good company where gardens are concerned, I like gardens of this sort that combine the best of the classic with the style of the wilder looking landscapes. Oh dear, do you think it’s a slippery slope now the crying has commenced?! If so, I approve of special places that have the power to touch our spirit. What an inspiring garden and so well illustrated by your photos. I’ll have to try to see how to arrange a visit and check out that book (I have Designing with plants). The Sesleria autumnalis looks interesting too. Do visit when you can, so much inspiration and even better than Ouldolf’s many fab books, lots on sale I the gallery shop ;). This is the first of his gardens I’ve seen except ‘on paper’, it’s wonderful, I’m even more determined to get to Pensthorpe next year, it’s long been on my list of gardens to visit. A fantastic review Kate. I really enjoyed this Autumn visit through your eyes and appreciated your planting notes too. The planting of the meadow is the distillation of Piet’s lifetime’s experience but the scale of it makes you think you could try and replicate a corner of it in a domestic setting. As you say, a truly inspirational garden. I am looking forward to seeing it in a different season next time we go down to the West Country. Thank you Sarah, I’m pleased you enjoyed it. I so agree, Ouldolf’s work just gets better and better, the scale of the planting seems effortless and so well suited to the site, it takes such skill to orchestrate plants that like this through the seasons and in situ, I am awe struck. As you say, there are lots of great combinations and ideas to takeaway and try in our own gardens – which is what I was looking for, for my patch, of course! I hope you enjoy your next trip and look forward to hearing about it. Having visited several Ouldolf’s gardens and read some of his books, when I read about this garden it went on to my wish list. Reading your blog it has gone to the top of the list. Thank you. Lucky you, having seen several of his gardens in person – this was my visit to one, so a momentous occasion for me. I have a long bucket list of his others to see one day, which would you suggest should be at the top? It is probably the furthest away, Scampston Walled Garden, Scampston Hall, Malton, between York and Scarbrough. Wonderful along with an excellent restaurant. I haven’t visited Trentham Estate which is closer, we are going with our garden club next year.